The idea of life ‘out there’ has entered ourcollective imagination as a form of modern mythology. The relatedphenomena of visitors from outer space, alien beings,extra-terrestrials, UFOs and flying saucers, sightings and abductionshave all provided inspiration and subject matter for late 20th centuryand contemporary visual art, cinema and literature. 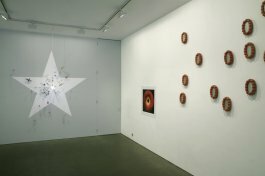 This exhibitionexamines aspects of belief, delusion, irony and fantasy around thesubject of extra-terrestrial life. Contact with extra-terrestrialbeings has been a source of fascination throughout history. 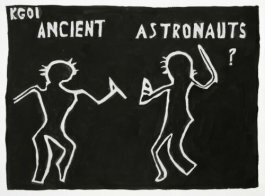 ‘Alien’manifestations in art include UFO-like objects and ‘spacemen’speculatively identified in ancient cave paintings and rock art onvarious continents, and the strange objects and apparitions that haverepeatedly appeared in religious paintings since Byzantine times. In 1938, Orson Welles, radio broadcast of H.G.Wells’ novel The War of theWorlds convinced many terrified listeners of a Martian invasion, but itwas not until 1947 that the UFO/’flying saucer’ entered modernmythology when a pilot described seeing ‘objects flying like saucers’above the mountains of Washington State. By the 1950s, flying saucersappeared throughout popular culture. The writings of Carl Jung andErich Von Daniken added momentum in the 1970s, and by the end of the1990s, interest in alien life peaked with millennium predictions. Artists have various perspectives on the concept of alien influence:Ken Grimes is an American artist who paints signs and symbols of UFOs,crop circles and alien figures. His art and writings document hisextensive study and quest on the margins of scientific research. Asingularly obsessive artist is Ionel Talpazan, a Romanian-born artistwho lives in New York, and has produced drawings, paintings andsculpture of flying saucers for over thirty years. 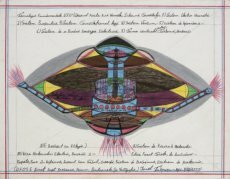 He traces hisinterest in UFOs to an encounter as a boy in rural Romania, and hisannotated drawings are diagrams of ‘advanced saucer propulsionsystems’. Committed UFO artists often focus on universal, almostreligious concerns – some such as Grimes, see meaningful coincidencesor potential salvation offered by extraterrestrials who will bringwisdom and progress to earth. 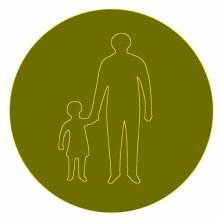 It is an alternative belief system ofalien abductions, government-sponsored conspiracies and messages from’out there’. 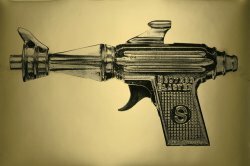 A more playful and subversive approach is taken by Swissartist Sylvie Fleury with her image of a golden Raygun – she says shelikes the idea of life on other planets, ‘in the sense that itrecalibrates our own perception of ourselves’. Zafer & Barbara Baran’sphotographic images reflect their interest in astronomy, and ashimmering blue disc evokes a mysterious presence in the blackness ofspace. Dutch artist Martyn Last’s small bronzes are the compresseddebris of our civilization left behind after The War of the Worlds. 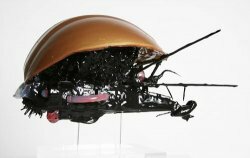 Jason Wallis-Johnson has made a sinister silicone sculpture – an alienmutant that quivers and gleams ominously; Shane Bradford’s Moth is awall installation ‘dart’ painting of dipped objects which won theCeleste Art prize in 2007. 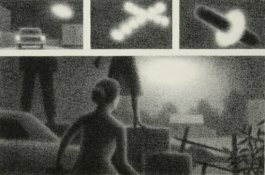 Michael Buhler has been intrigued by UFOssince the 1960s, when he began a series of drawings of alien encountersand abductions. He has since developed a series of white boxedconstructions with UFOs hovering serenely above ‘our’ world. JamesBurbidge has made a group of enigmatic sculptures from ‘a world ofunnamed objects and things, whose function is yet to be discovered’.James Lancaster’s small, intense drawings depict chimera hovering inluminous space. 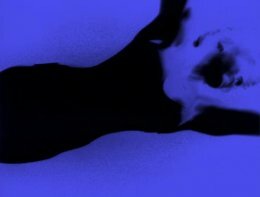 Tina Keane once stated that ‘art for me is aboutdefining many different forms of reality’, and her mysterious, poeticfilm from 1996, Beyond the Blue Grain will be on view in the lowergallery.